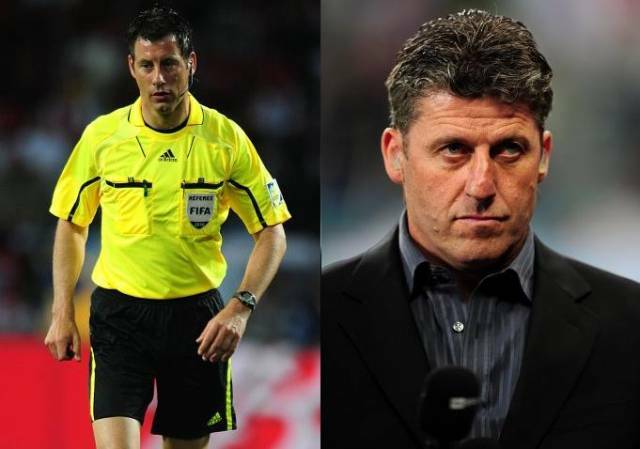 ITV sage Andy Townsend has been speaking to the Daily Mail this morning about how he very nearly got his face torn off in a Madrid restaurant after being mistaken for Wolfgang Stark, i.e, the referee that took charge of Wednesday night’s Champions League semi-final between Real Madrid and Barcelona. “I went into a restaurant and was eating when I noticed people looking at me. Some of them started taking pictures and then someone came and gave me a pot plant, saying, ‘This is for you’ with a funny look on his face. “There were 10 of us around the table thinking, ‘What is going on here?’ When I stood up I got booed and when I went to the loo I got followed there and back. A waiter escorted me to my seat… I didn’t know why! “Then people came up to me, talking aggressively in Spanish and there was a man shouting at me from the other side of the restaurant. It was all getting out of control. “Then it dawned on me – because I still had my UEFA accreditation around my neck they thought I was the referee. To them I was Wolfgang Stark! So I had to turn around and tell them I was from English television. “[Adrian Chiles] has started calling me Wolfie, but actually there’s a sinister edge to it. The crowd were baying for the referee’s blood. “They totally saw the referee as the villain of the piece. That’s how Mourinho whips up a frenzy. As ITV were going off air there was actually a fight going on in front of me in the stadium — two men were exchanging blows. And these were the decent seats. Anyone else get the feeling that there was absolutely no case of mistaken identity involved? Those frothing Madridista’s knew full-well it was the gurning fool from the tactics truck. Completely agree with the last sentence in the article, they knew it was Townsend and that’s why they kicked off, not mistaken identity haha.